The Wembley-winning Posh team from 1992. Current Peterborough United manager Steve Evans admits he’s thrilled by comparisons between his side and Chris Turner’s legendary Posh first-team squad. Turner managed Posh to back-to-back promotions in the early 1990s. His team became the first to represent Posh in the second tier of English football in the 1992-93 campaign. Legendary Posh manaber Chris Turner. That Posh side had powerful defenders like Dave Robinson and Steve Welsh, a flamboyant winger in Bobby Barnes plus a disciplined wideman in Worrell Sterling and two quality strikers in Tony Adcock and Ken Charlery plus an inspirational captain, Mick Halsall, operating in midfield. Evans team is also full of rugged defenders, wingers in Joe Ward and Siriki Dembele who have similar skills to Barnes and Sterling, a lively front two in Matt Godden and Jason Cummings and Alex Woodyard leading by example in midfield like Halsall. Getting the ball forward quickly and efficiently was a hallmark of Turner’s team. The man with a statue outside the ABAX Stadium also encouraged his men to play their football in the opposition half. The current Posh team employs similar methods. “It’s not for me to make the comparison with one of the best Posh teams in history,” Evans said. “But it’s certainly a huge compliment to the current squad. “Obviously we haven’t achieved anything at all yet, but if I can emulate Turner I will be a very happy man. “We are a better footballing team than some people realise. You don’t select the likes of Dembele, Maddison, Godden and Cummings and then ask to them to hoof the ball forward aimlessly. “We’ve changed a few things, but we believe we are playing exciting, attacking, football at a decent tempo. Four League One wins have included 10 Posh goals. 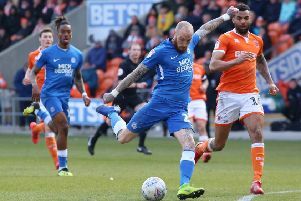 Posh kept their first clean sheet of the campaign when winning 1-0 at Charlton on Tuesday. Turner’s third tier promotion-winning side started their season with five new faces in the starting line-up (Evans had nine). They finished sixth in League One, but beat Stockport 2-1 in the play-off final at Wembley to reach the old Division One. Teams left in Posh’s wake back in 1991-92 included current Premier League sides Huddersfield, Bournemouth and Fulham as well as several clubs now playing in the Championship including West Brom, Bolton, Wigan and Swansea. Posh seek a club record fifth straight win at the start of the season at Plymouth tomorrow (August 25).